BEATLEMANIA! From Love Me Do to Let it Be, Roll up, roll up, for a rip-roaring magical musical tour through the back catalogue of the world's greatest ever band. Every song is a winner in this note-perfect musical love letter to the Fab Four. John, Paul, George and Ringo take to the stage one more time as the supremely-talented cast revive all 17 of their No1 hits including: She Loves You, Can't Buy Me Love, A Hard Day's Night, Help!, We Can Work it Out, All You Need is Love, Get Back and so many more. . . including a five-star performance of Hey Jude on the golden anniversary of the four-times platinum classic hit. From their mop-top Beatlemania beginnings to thepsychedelic highs of Sgt Pepper and beyond, all the biggest hits feature. The most authentic production on tour brings The Beatles to life, live on stage. Stunning attention to detail - from the original musical instruments and stitch perfect costumes even down to Lennon and McCartney's on-stage banter -combines with superb vocals and sublime musicianship. Money can't buy you love, but it can get you seats for an evening to remember featuring the biggest and best songs ever recorded, performed live in concert. 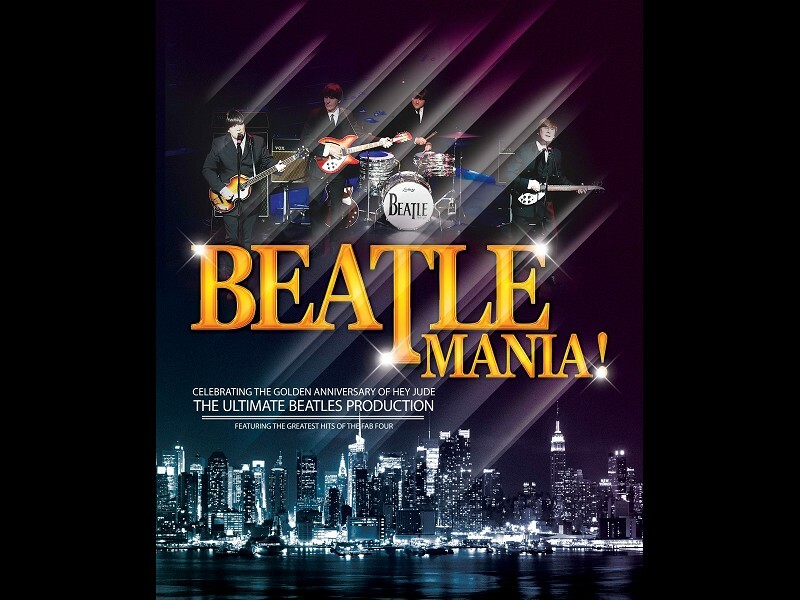 Get your ticket to ride back in time in style with the incredible Beatlemania!